Rocky Sequels: Which is your favourite? / It's Just Movies "Rocky" Sequels: Which is your favourite? The Rocky franchise is loved by millions, and its many installments and commercial success are very much testament to this. Its popularity is reflected in the Rocky-themed merchandise that is available to buy. From US flag shorts, to sweatshirts adorned with famous images, to Rocky slots on www.slotsites.net, it’s pretty clear that the original 1976 film has an enduring legacy. As with any great film franchise, debate is still rampant over which are the best of the six Rocky films. Most agree that the first film is the best; of which its 1977 Oscar for Best Picture is proof. The idea that the Rocky franchise needed to come down from the overblown nature of “Rocky IV” was a good one. 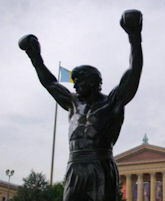 So understandably, we see Rocky go from immense riches and back to the rags he started with on the streets of Philly. Yet despite the fact that original director John G. Avildsen was back behind the camera, this film fails to take Rocky back to his roots. A stupid plotline and clear lack of emotional honesty are very much this film’s undoing. A plotline in which Rocky single-handedly overcomes communism and the might of the Soviet Union in revenge for the death of his best friend is ridiculous. Despite a strong performance from lead villain Ivan Drago (Dolph Lundgren), this lacks any real story or character development. Most of the film is basically a series of training montages and flashbacks. While overblown, jingoistic and dated, this film is entertaining, largely because of just how ridiculous it is. Whereas the first two films were based in the harsh, yet honest reality of working class life in 1970s Philadelphia, Rocky III turns its main protagonist into the glossy all-American hero that reaches even more ridiculous heights in IV. While also lacking the emotional weight of some of the other installments, it is a very enjoyable. And Rocky’s devastation at Mickey’s death is genuinely touching. The admittedly cartoonish Clubber Lang (Mr. T) is such a nasty piece of work, which is what makes it so satisfying when Rocky knocks him out in their rematch. The burgeoning friendship between Rocky and Apollo Creed (Carl Weathers) is a nice touch — although we never get to find out why Creed would train Rocky rather than getting in the ring himself. “Rocky II” is great. Much of the reason for this lay in the way it takes Rocky to its natural conclusion; after such a good performance against Creed in the first fight, anything is possible, right? Yet, it repeats the formula of achievement against the odds without becoming tired or cloying. We see Rocky enjoy the proceeds from the first fight with Creed and then struggle to make ends meet. Rocky’s journey after becoming people’s champion develops his character. And the moment he becomes the actual Heavyweight Champion of the World is the powerful climax everyone wanted to see. “Rocky Balboa” surprised nearly everybody when it came out in 2006. Not only is it a great film, but it is arguably the best sequel of the entire franchise. The death of wife Adrian and Rocky’s difficult relationship with his son add real emotional depth. What’s also great about this sixth installment is its humanity. Just like the original film, it explores the character of the underdog, rather than montages. Having said that, the fight itself is a sight to behold.